Some people have a way of being upbeat and chipper, even if things are difficult for them. While some might have a more somber or even just direct personality, there are others who are constantly cheery. 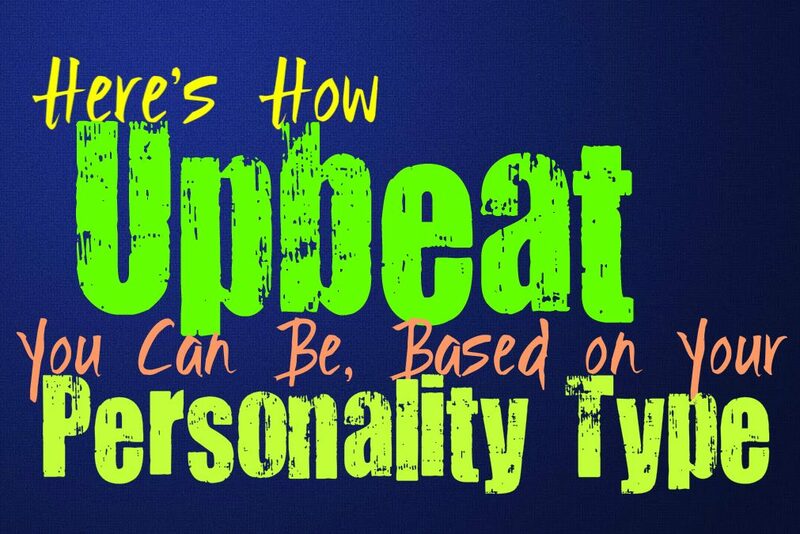 Here is how upbeat you can be, based on your personality type. INFJs aren’t usually all that upbeat, even when they are feeling positive about something. They don’t usually have an overly cheerful personality since they can keep to themselves most of the time. While INFJs aren’t likely to be upbeat all of the time, they can be around the right people. When the INFJs has to be this way to avoid drama or probing, they will definitely appear more upbeat than usual. They can also be a bit more cheerful if they are in the right mindset and the person accompanying them simply brings out this side of them. INFJs just can’t maintain this chipper demeanor all of the time and are likely to become drained by it after a while. ENFJs can certainly be upbeat when they are trying to remain in the right mindset about things. They especially can be upbeat around their loved ones, in order to keep the mood positive. They don’t want to be the ones bringing down the people around them, and so ENFJs will try their best to remain upbeat and charming. They do of course have times when they aren’t feeling all that chipper, but they do their best to maintain their positivity around their loved ones. They just don’t like bringing others down, and try not to be the one making things difficult on anyone else. INFPs don’t usually have an upbeat personality, especially not around larger groups of people. They don’t like having to pretend to be feeling upbeat, especially if they are feeling something else entirely. INFPs can become so caught up in their own thoughts and minds that they don’t really find themselves paying attention to the world around them. INFPs don’t pretend to feel differently, and will only be upbeat if this is sincerely how they are feeling. They don’t like hiding who they are or what is going on inside of them, since this feels very insincere to them. ENFPs can certainly be upbeat in the right circumstances, but they tend to follow their current mood. They do try to be positive and look on the bright side of things, since ENFPs don’t like allowing negativity to drag them down. They try to remain focused on the things that makes them happy, and often attempt to avoid confrontation. ENFPs can certainly be upbeat people when it feels right for them. They do strive to be sincere people and so if they aren’t feeling all that upbeat it can be hard for them to feel like faking it. INTJs are rarely upbeat people, mostly because they are more realistic than positive. Instead of having to put a cheery spin on things they prefer to remain focused on what is practical. They don’t like being forced to put some sort of positive spin on things, and can find this to be a bit insincere. INTJs are also rather reserved with their emotions, and don’t find it easy to express them openly. INTJs aren’t often upbeat or chipper people, it just doesn’t fit into their personalities or how they appear outwardly to others. ENTJs are not often upbeat people, even though they can be rather friendly and outgoing. They don’t have personalities which are often perceived as peppy or particularly chipper. Instead they are often very driven and sometimes aggressive people, especially when they are trying to get something done. ENTJs are more logical and practical than they are emotional, and so being upbeat isn’t really natural for them. They also have a hard time outwardly expressing their inner emotions, which makes them appear more to the point than upbeat. INTPs might have moments where they feel upbeat internally, but this doesn’t easily show on the outside. They don’t find it natural to express their emotions and can seem quiet stoic most of the time. It just wouldn’t be naturally for the INTP to appear upbeat, it might even be difficult for them to show this intentionally. They are just very internal people, who have a hard time knowing how to express themselves in a way that translates openly to others. ENTPs can be upbeat people, especially when they are enjoying a social encounter. They are logical and realistic people, but they enjoy coming across as fun and adventurous people. They don’t like dwelling on things and appearing negative to those around them, as this just seems a bit too vulnerable. ENTPs can turn most things into a joke, and like being able to have a good sense of humor. They do their best to be upbeat most of the time, but not when they are trying to focus on being more realistic and logical. ISTJs aren’t usually upbeat people, mostly because they aren’t that open about their feelings. ISTJs can often appear rather stoic, even if they are excited or feeling happy about something. They are reserved and focused people, who can be much more practical than emotional. They don’t usually appear upbeat most of the time, even if they are feeling it internally. ISTJs just aren’t that expressive and forcing it just isn’t something they can readily do. ESTJs aren’t incapable of being upbeat, especially in the right social setting. When they are around loved ones and friends they do enjoy being social and fun-loving. At the same time ESTJ aren’t great at pretending to be upbeat when they have something else occupying their thoughts. They work hard to get things done and are very practical and focused people. For them it can be a bit draining to have to have to be upbeat when they are trying to do something important. ISFJs can certainly be upbeat people, especially when they are trying to be positive for their loved ones. They do whatever they can to provide for their loved ones and want to make them happy. Since ISFJs are focused on pleasing others, they often try to put an upbeat spin on things for their sake. In order to make sure to maintain a sense of peace and harmony in their environment, the ISFJ often needs to put an upbeat spin on things. ESFJs can often be upbeat, especially when they feel they need to for those around them. When someone the ESFJ loves needs to be around a positive energy, they will often push themselves to be upbeat. Most of the time they focus on providing for their loved ones and so they don’t want to do anything that might drag them down. For ESFJs it is important to be there for those around them, and do whatever they can to make them happy. Even if they are feeling down they don’t want to bring others down with them. ISTPs aren’t usually upbeat people, and can be a bit stoic most of the time. They don’t like having to pretend to feel positive about something, and prefer to be focused on being sincere. ISTPs aren’t very emotionally expressive people and become rather drained by people who want them to pretend to be upbeat. They keep things to themselves most of the time and really just don’t open up all that easily around others. ESTPs can be upbeat if the situation calls for it, but at the same time they are very realistic people. They focus on facts and sometimes this can cause them to be more direct than upbeat. ESTPs don’t mind having to remain positive in certain social situations, since they don’t like bringing down the mood. ESTPs live in the moment and will follow whatever feels right for them at the time. Sometimes they struggle to remain upbeat when they are feeling down about something, but they can certainly be upbeat with the right environment. ISFPs can certainly remain upbeat, and often try to be as positive as they can. They follow their hearts and want to seek out whatever brings them joy. They live so much in the moment that sometimes their emotions can drag them in different directions. When the ISFP is truly upset about something then remaining upbeat can be a bit challenging. When they can be positive they will be though, and strive to focus on the good things in life. ESFPs do try to remain upbeat most of the time, and don’t like allowing negativity to drag them down. They try to remain positive when they can, and will focus on the things that make them happy. ESFPs just want to have fun and enjoy the present moment, instead of getting hung up on anything that might make them feel bad. ESFPs simply don’t like dwelling on the bad things in life, and truly just want to focus on the things that make them and their loved ones happy.